Posted on August 19, 2018 by DrLax. Lacrosse continues to spread as America’s fastest growing sport, yet its participants remain primarily affluent white. 86% of college lacrosse players are white and when we narrow down our focus to Division I lacrosse, the number of white players increases to 98.1%. Despite NFL Hall of Fame running back legend Jim Brown (an African American man) taking great pride in his legendary lacrosse career at Syracuse and remaining an active ambassador for the game, as well as lacrosse showcasing extremely talented and charismatic African American players like Chazz Woodson, Miles Jones, and Tari Kandemiri; there remains a glaring lack of African American and other minority participation in the sport. This is very odd in a sport whose origins trace back to the indigenous Native American people of North American continent. Why is this the case? From my own observation though the years dating back to when I played youth ball, I have learned that there are multiple reasons for lingering lack of diversity in the game of lacrosse. This was more a factor in the 80’s and 90’s than it is today when one did not see as many African Americans living in affluent middle class and wealthy communities as we do now, as African Americans were beginning to transcend generations of oppression in the United States and increasingly join the ranks of middle class, upper middle class and wealthy suburbia. In more urban and inner city communities where a higher percentage of African American people lived (and to a large degree still do today), schools simply would not or could not invest precious little financial resources into offering a sport that was so far outside of the main stream. For those areas, that remains largely unchanged. The cost of gear for families was and is a significant barrier to entry into the sport. While most schools that have lacrosse provide equipment for the players during the spring season, in a sport where participation in club teams, camps, and prospect events, it really has become essential for players to have their own gear. Still, in my generally affluent home town of Viera, Florida where like other middle class communities communities across the nation there is a refreshing shift with increasing populations of African American families adding diversity to suburbia, money for these families is generally not a significant barrier to participation. This bring me to my next point. I recall when my friends and I were all falling in love with the sport of lacrosse as kids and much to the chagrin of our fathers we gave up baseball. Having grown up idolizing the stars of the national past time in an area steeped in the tradition of the NY Yankees, NY Mets, and Brooklyn Dodgers, many of our dads were confounded that we would give up baseball for this weird sport called lacrosse. Of course over time watching our games and experiencing the exhilaration of the fastest game on 2 feet we changed their hearts and minds, it did not happen over night. Beyond being a sport that was foreign to our fathers, they also would say things like, “there’s no money in lacrosse,” suggesting that we were potentially throwing away a lucrative Major league Baseball contract one day by choosing lacrosse over baseball. While a tiny select few reach the ranks of Division I college and professional in all sports, the vast majority athletes will not. As such, becoming a professional athlete as primary motivation for participating in youth and high school sports is very misplaced motivation. Try telling our fathers that in the mid 80’s. When a small group of individuals started lacrosse here in 2008, we got the same push back from even white affluent parents, but again gradually won many of their hearts and minds as they accepted and later embraced the sport of lacrosse. To this day, however,as our lacrosse club grows exponentially each year, African American participation remains sorely lacking despite us marketing to the same schools their children attend and holding free introductory clinics in the parks of the community they live in. I got some insight as to why this is one year when my son played a season of tackle football and I befriended the many parents of my son’s African American teammates. Naturally, I was recruiting for lacrosse while I was playing the rare role of sideline parent and in the course of several conversations I had, I learned that families simply retain a cultural hangover from a time in the not so far off past when because of lack of equal opportunity, sports were viewed by in large as a primary means to an education and even a path to wealth that becoming a professional athlete would bring. Having seen the barriers that the sport of lacrosse has overcome in the years I have participated in the game, I hold great hope that we will at some point make inroads in drawing more minority participants. With US Lacrosse initiatives including their First Stick program where they provide equipment grants to urban and less affluent suburban communities and the Urban Lacrosse Alliance that is dedicated to creating and sustaining urban youth lacrosse programs, slowly but surely we will see a day when lacrosse is a staple sport representing many classes ans cultures. Posted on August 1, 2018 by DrLax. 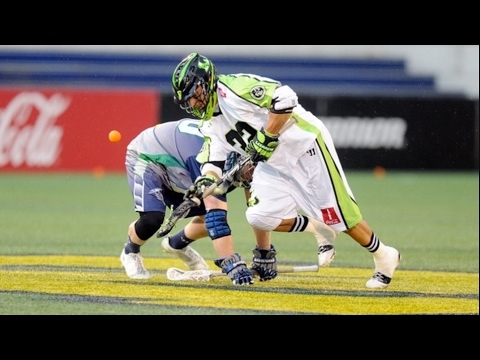 The face off in lacrosse has evolved through the ages in terms of line up, speed of whistle, and distance of the head from the ball as two face off players line up to with the back side of the heads on either sides of the ball in a crouched position as they await a whistle to battle for possession of the ball. Possession of the ball is very important in lacrosse, as Division I college teams score 41% of the time per possession, making the face off position extremely important; often the deciding factor in whether a team wins or loses. Many face off guys are very good all around lacrosse players but often as they advance in the levels of lacrosse, they increasingly stand out as winning face offs being their best contribution to the team. Duke head coach John Danowski once famously said [referring to the face off specialist] that in the game of lacrosse, “the worst lacrosse player on the field often determines the outcome of games.” Hence the now common position known as the FOGO, an acronym for Face Off, Get Off. What I have learned about face off dominance in my years of playing and as a coach is that even the best lacrosse players just simply cannot be trained to be great face off guys. It really is a skill you either have to do not, nonetheless, if a player shows aptitude in face off, it is important to nurture that player and get him the best training he can attain to hone the skill. Case in point, my strongest all around player in the 10U boys travel division I coached this past season is a boy named Jackson. There is nothing this boy cannot do, often netting us 9 points per game while playing incredible defense, with seemingly endless stamina as a midfielder. Yet, as great as an athlete as Jackson is (perhaps the best I have seen in a player at this age), Jackson was not very strong as face off. We had the good fortune to bring in Dylan Lowdermilk, 2 time All-American face off at FSU (4 year all district face off middie from one of our local high school teams and now graduated, face off coach for FSU) to work with our travel teams. I asked Dylan during practice to take groups of 4 of my team during practice, work through face off technique, and determine who my best face off players were. Interestingly, a boy named Tommy, the youngest boy on the team who had just started playing lacrosse this year but showed enough raw athletic ability that I believed he could be developed into a travel team lacrosse player, proved to be our top face off prospect. By our final tournament of the summer season, Tommy became our go to face off player and enjoyed incredible success despite being young player so new to the game. So what it is about certain players that just have that gift for face off? Bringing up Tommy is a perfect segue into the sport science of face off, since ESPN did an analysis on arguably the best face off specialist in college, Team USA, and professional lacrosse history: Greg Gurenlian. Tommy’s parents enrolled him in a face off academy clinic with none other than Greg Gurenlian this summer. Reaction Time – Average reaction to the whistle is 150 milliseconds. Gurenlian’s is 130 milliseconds, translating into a 13% advantage in reaction time than the average human. Clamp – During his clamp, Gurenlian rotates his head by swinging his bottom left hand on the shaft at 770 degrees per second, beating his average opponent to the clamp by an average of 0.02 seconds (the same amount of time it takes a humming bird to flaps its wings). Defensive Exit – Once securing the ball, Gurenlian rips the stick out at 14. miles per hour, then sweeping the ball with his head at 3 G’s of acceleration…this adds up to Gurenlian escaping the face off space in less than 0.43 seconds! All told, Gurenlian gains full possession of the ball in 0.23 seconds, 7% faster than an NHL hockey face off. 3.) Strong upper and lower body acceleration. To be sure, many of these skills can be honed and improved but it seems a lot of being a great face off lacrosse player is God given. It is incumbent upon us coaches to be able to recognize these face off beasts early and point them in the direction of the best face off instruction we can offer them.